Despite the sorrow of its title, and my heart crumples like a coke can will have an utterly expansive effect on the reader’s beat-box. My little heart almost burst as I read through this collection for the first time. And then the second. Like some classic 90s rom-com – or was it drama? 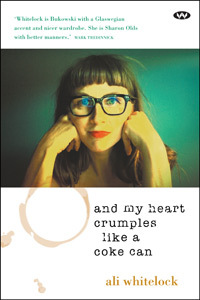 – that you watched and then re-watched every weekend on VCR as a teen, Ali Whitelock’s book seems to encourage a closeness, invites the reader to experience a genuine connection with the poet/protagonist and with their bevvy of sidekicks, both the heroes and the villains. I find myself genuinely touched by the liquid, visceral rawness, the careful simplicity and confessional glory of Whitelock’s poems. with the snoring tape – he keeps it on the side of his bed. marked ‘bloods’ which I didn’t find strange. These excerpts also highlight the less cohesive aspects of the collection, which are the slightly discombobulating lineation choices, and collisions of atypical sentence structures. Quite often, the poems appear as performance texts adjusted for the page; sometimes fully punctuated and precise, and sometimes – part emphasis, part rebellion, I’d imagine – utterly not. While Whitelock’s lineation most often works to build emphasis, at other times it can start to feel a little heavy-handed, especially when the powerful and poignant word choice is more than capable of speaking for itself and perhaps needs no further emphasis. That said, anyone who has read the Beats, perhaps especially Bukowski (who is clearly, wonderfully, a strong influence on the collection), will have little or no problem navigating the momentary bumps caused by unpunctuated sentence collisions. Certainly, when listening to these poems read aloud (in a smoking hot Scottish accent; Whitelock is an impressive reader), any thought about formatting fades away. This entry was posted in BOOK REVIEWS and tagged Ali Whitelock, Ivy Ireland. Bookmark the permalink.